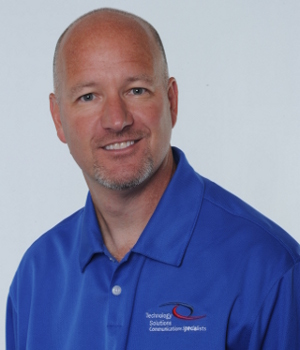 Steve Futrell, a leading entrepreneur in both technology and telecommunications, is CEO of Technology Solutions. Over the years, Steve has built Technology Solutions into one of the region's most respected and well-managed organizations. Originally formed to provide top quality equipment and services for small to mid-sized businesses in Southeastern Michigan, Technology Solutions has expanded both technologically and geographically. We now provide solutions across the United States. Steve's mission has always been to provide solutions that help customers increase profitability, improve employee productivity, and give them a competitive advantage in their respective marketplaces. Because of his expertise in business management, communications technology and strategic development, Steve is frequently asked to speak to industry associations and at local business functions. He recently spoke at Technology Assurance Group's (TAG) National Convention on the topic of VoIP and how it's rapidly changing the way companies communicate. Presidents and owners of 100 companies representing more than $385 million in products and services listened to Steve's views and insights on the topic. A graduate of Eastern Michigan University with a degree in Business Management, Steve is very active in the community, frequently offering his time and talents to charitable organizations.